"Total renewable electricity generation grew strongly in 2012, increasing by 8.2% from 2011. 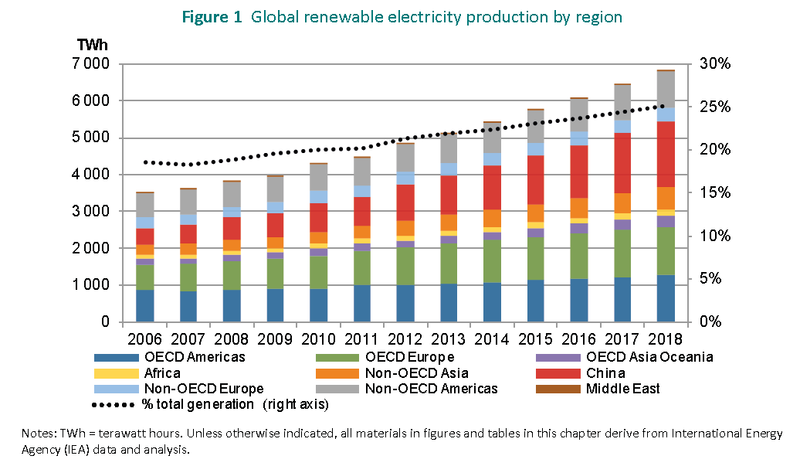 In absolute terms, global renewable generation in 2012 exceeded the electricity consumption of China. Part of the strength in 2012 growth stemmed from stronger-than-anticipated hydropower production, particularly in China. Yet it also reflected a continued rapid build-out of non-hydro sources, whose generation rose by 16% year-on-year. 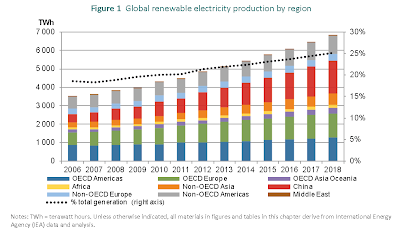 Among the OECD regions, non-hydro renewable generation was the second largest source of power generation growth in 2012, expanding by 90 TWh. By comparison, gas-fired generation rose by over 150 TWh, while both coal and nuclear declined." Read the executive summary of the report in full. With Tony Abbot (Liberals) vowing to scrap the price on carbon and Kevin Rudd (Labour) going half the same way Australian politicians appear to be still trying to buck the worldwide trend ignoring the will of the majority of Australians who in record numbers have installed solar PV on their roofs. Question remains why the same majority acts as if there are only the aforementioned political parties which do everything to satisfy the billionaires of the country who run the coal mining, fossil fuel power generation, and media industries.